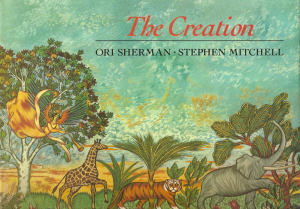 In this extraordinary book, two artists have taken to heart the phrases and images of the creation story and produced a joyous, vividly imagined, and graceful interpretation of the first chapter of Genesis. Ori Sherman’s glorious paintings swirl with the glowing chaos of the unformed world, then shine with the first light, and burst into life with the creation of living things. His unique vision is mirrored in the words of acclaimed translator Stephen Mitchell, who has newly adapted the Biblical text for children, with a fresh simplicity that remains true to the original.